Professional live and on-demand streaming video delivery that can simultaneously stream to YouTube, Facebook, Twitch, Twitter, and more. What if you took YouTube and made it private? Have more control, monetize your streams and keep 100% of the proceeds! What if you could stream to your private network of viewers and simultaneously to YouTube, Facebook, Twitter and Twitch – for free? Arcus includes DiscoverVideo’s Streamsie software encoder for Windows, Mac, and mobile iOS devices (Android coming soon). But Arcus is compatible with virtually any streaming encoder, including Mantis, Spider, or new or existing 3rd party encoders. Detailed reports show you where your viewers are, their IP address, and their viewing behavior. You’ll have secure, reliable SSL streaming to desktops on IE, Safari, FireFox, Chrome, Edge, iPhone, iPad, Android, and Set Top Boxes. Upload your recorded events, or upload any compatible video, including 360-degree video, and organize your content into channels. Create events and include video or image Advertisements. It’s all built-in. Want to display Digital Signage? It’s included in Arcus for no additional change. Just point your SignStick to your Arcus account and deliver stunning, easy-to-manage, live and on-demand Digital Signage displays in minutes. And because SignStick caches VoD content, your signage consumes very little of your Arcus bandwidth plan. You can set up ARCUS today with a purchase order or credit card by calling us at (860) 800-9922. Monitor the amount of bandwidth your viewers are consuming on your control panel. More bandwidth, storage, and add-ons are instantly available. Discover Video uses the best Content Delivery Network providers and its own services to provide the reach and scale you need. Whether you are doing a live broadcast to 10 or 10,000 viewers, the service will scale to meet your needs. 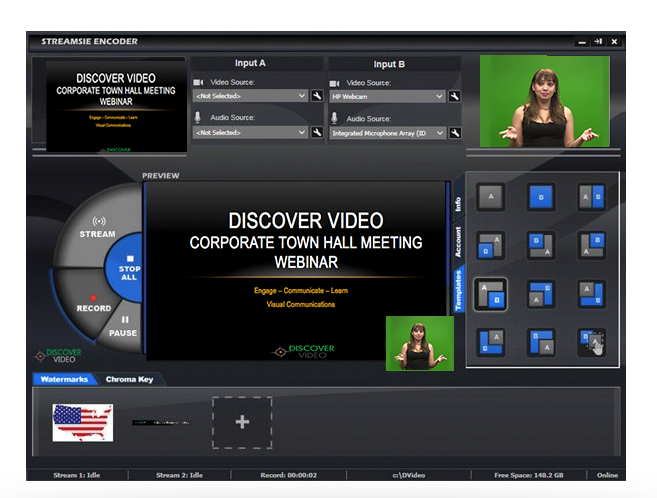 Use Arcus for any type of live streaming from corporate Town Hall Meetings and Training, Graduation Live Streaming, Video Morning announcements for K12 education, and Government meeting streaming. Arcus is an affordable solution for Live Streaming and VOD. The service is already integrated with Streamsie, Mantis, Rover, Spirit and Hornet encoding systems making it incredibly easy to use. Arcus can be used with other H.264 encoders.